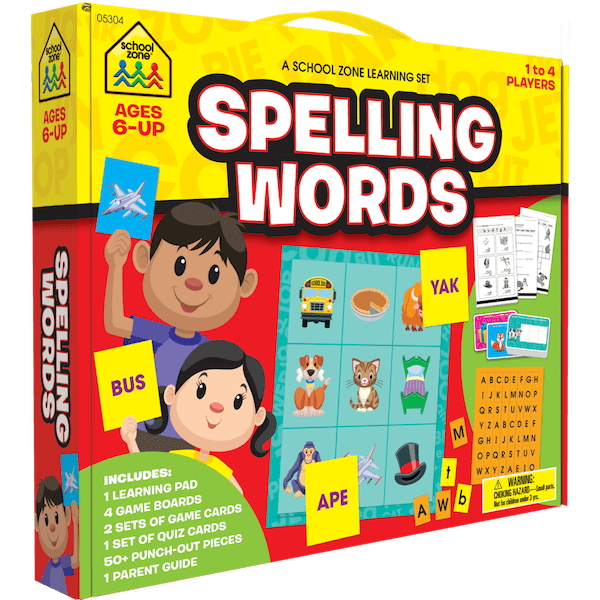 The School Zone Spelling Words Learning Set is a great gift for kids ages 6 and up! Spelling success starts with practice! This learning set provides multiple ways to learn and contains everything kids need to spell words with confidence. Kids will enjoy the variety of activities and the whole family can join in the fun! Play multiple games with 4 Lotto boards and 72 cards. Use bold, bright, press-out letters for spelling words on 28 double-sided quiz cards. Get pencil-and- paper learning with 48-page workbook. A+ learning for 1 to 4 players! Shop for the School Zone Spelling Words Learning Set now!